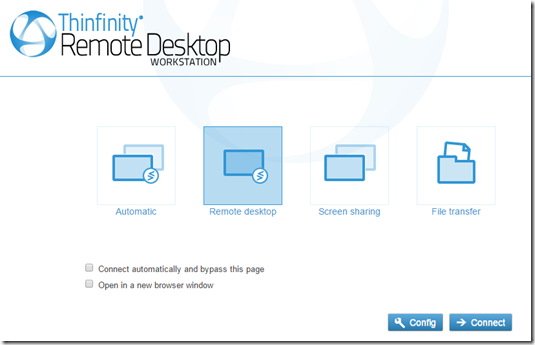 Thinfinity Remote Desktop (commonly known as ThinRDP) is offered by Cybele Software, Inc. and is available either as Server or Workstation edition. The Server edition is targeted at multi-user Terminal Server-style environments, while the Workstation edition provides a plain web-based RDP client for remote access to single VMs, leveraging technologies like HTTPS, WebSockets and HTML5. The Workstation edition is ideal for our purposes, and it can even be used for personal or commercial use at no charge, you can ask for a free license here. In order to get started, it’s also possible to download a free 30-day trial on their website, that’s what I did for this post. On top of its RDP-over-SSL capability, ThinRDP Workstation provides powerful features like support for RemoteFX, remote audio & printing, Active Directory integration and a nice file transfer capability we will have a look at later in the post. 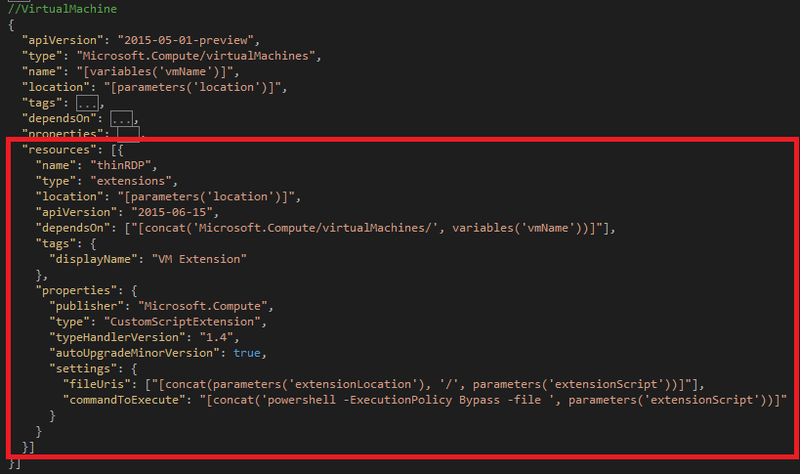 We will deploy our sample virtual machine by using an Azure Resource Manager (ARM) template via PowerShell, as described here. The template defines all resources to be deployed within a Resource Group using a declarative approach in terms of a JSON document. 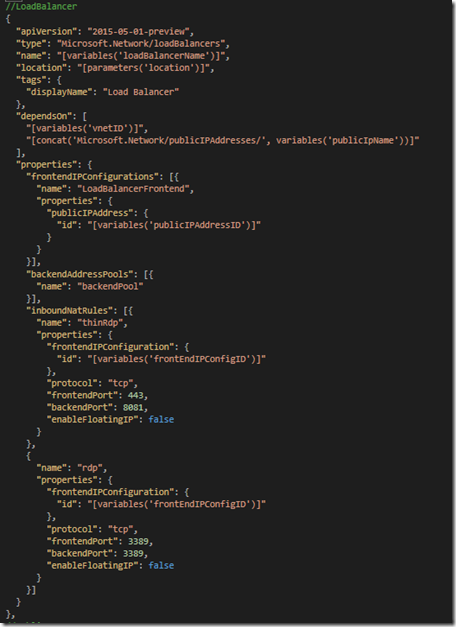 If you know how to work with ARM templates and want to get started right away without understanding all the implementation details, you can download the template & PowerShell script from my GitHub repo ThinRdpOnAzure and deploy it into your Azure subscription now using the ‘Deploy to Azure’ button. In this case move on to chapter Connect to the VM through the Browser below in order to access your machine after it has finished provisioning. Note: the custom script extension is not shown in the resource group view, as it is executed within the VM during provisioning of the template. All resources specify their location using the location parameter described above in order to stay within the same datacenter. 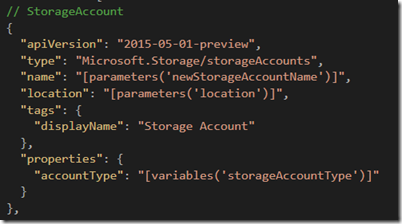 The storage account type is defined in the variables section of the template, for options see Azure Storage Replication. 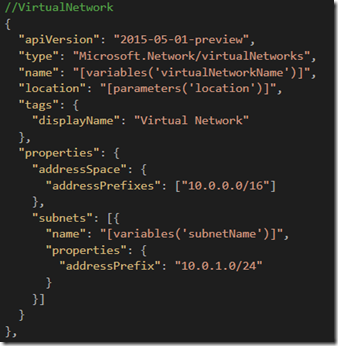 The template defines the IP address ranges for the VNet overall and for a single subnet that will host our VM. 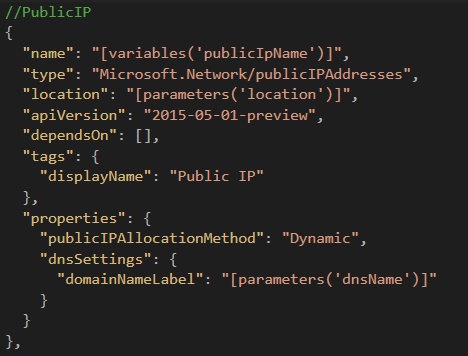 The public IP will be associated with the dnsName prefix specified in the parameters section above. 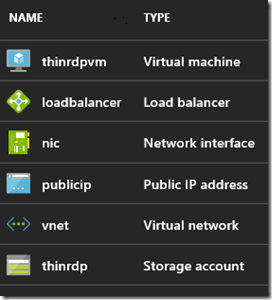 You might now say: why do I need a load balancer (LB) if I want to deploy only a single VM? Well, despite its name, the Azure LB does not only distribute traffic between multiple instances, but also provides NAT capabilities, for details I recommend to read this post. The load balancer gets attached to the public IP address specified above via the frontendIPConfigurations property. The NIC resource defines the subnet association to the VNet, as well as the IP address allocation method (dynamic/static) for the address pool of that subnet. The NIC gets associated to the backendAddressPools of the load balancer, so the LB knows where to route traffic to. The NIC also gets linked to the NAT rule(s) of the load balancer (loadBalancerInboundNatRules). This looks like any other VM resource in ARM, specifying parameters like VM name, size, image, RDP user, storage location, etc. Note that the VM gets bound to the NIC we specified above and thus will also be targeted by the NAT rules defined in the load balancer. 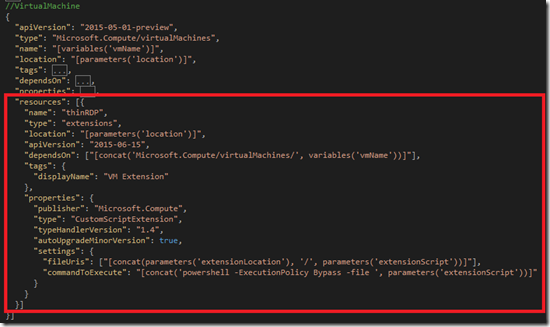 You need to make sure that the blob container in Azure storage has public read access defined, so the provisioning engine can retrieve the extension script from that location. You could also use a Shared Access Signature to secure that URL, which I left out here for the sake of simplicity. Invoke-WebRequest "https://<…>.blob.core.windows.net/ extension/Thinfinity_Remote_Desktop_Workstation_Setup_x64.exe" -OutFile "c:\temp\thinrdp.exe"
The script creates a directory c:\temp on the VM, downloads the ThinRDP Workstation trial setup executable from a blob storage URL (that has to be configured for public read access) and then starts an unattended setup. 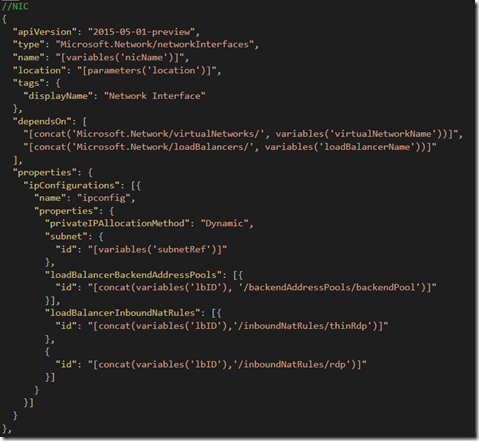 This will install ThinRDP with its default configuration in the VM, i.e. after finishing the ThinRDP web server will start listening on port 8081. 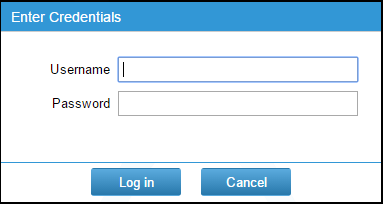 The setup also opens the corresponding port in the local Windows firewall of the VM. 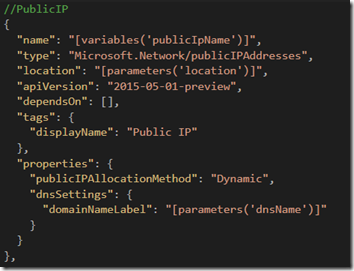 If you like, you can deploy the template via the ‘Deploy to Azure’ button in my GitHub repo. Just enter the parameters described in chapter Parameters above, create a new Resource Group, accept the legal terms and off you go. 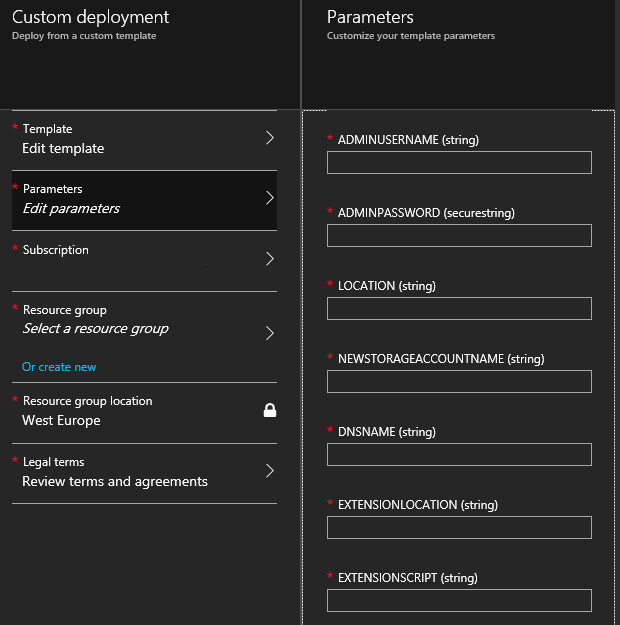 New-AzureResourceGroup -Name $group -Location "West Europe"
New-AzureResourceGroupDeployment -ResourceGroupName $group -TemplateFile ".\ThinRdpVm.json" -TemplateParameterFile ".\ThinRdpVm.param.json"
Note that you need to have both the template and the parameters file in the PowerShell execution directory. 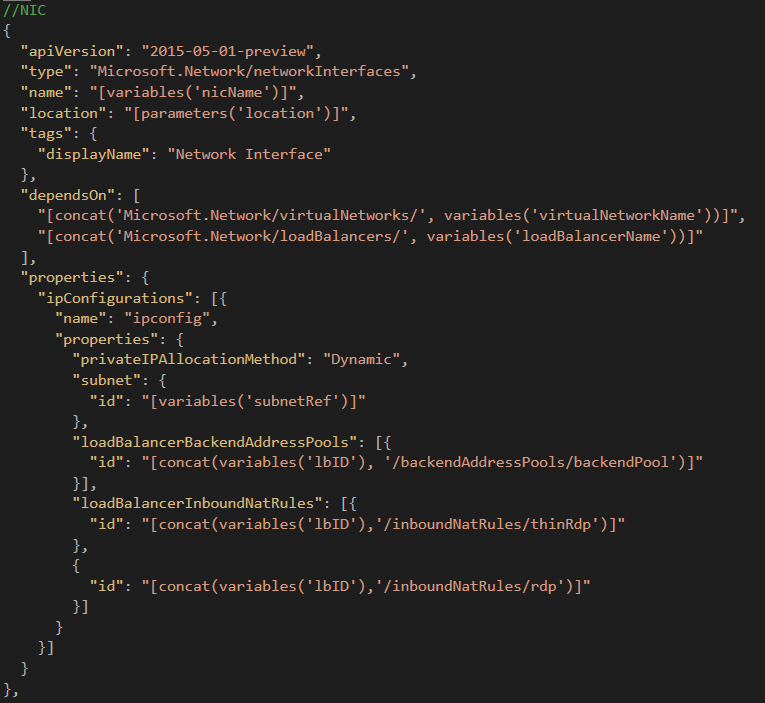 The file ThinRdpVm.json contains the ARM template itself, while the parameters are defined in ThinRdpVm.param.json. You will probably have to change the values from the repo in order to get unique DNS names for your VM and storage account. 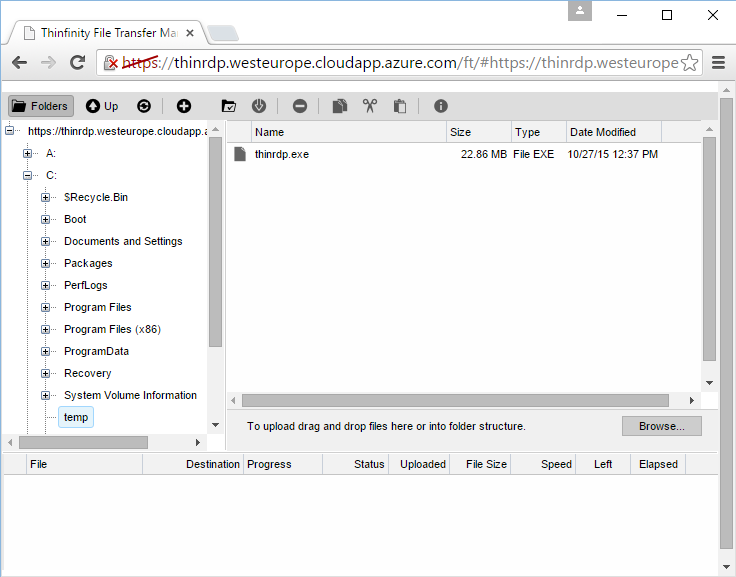 You should also create your own storage account, upload the ThinRDP setup executable as well as the custom script extension file. Don’t forget to make the blob container read accessible, as mentioned before. 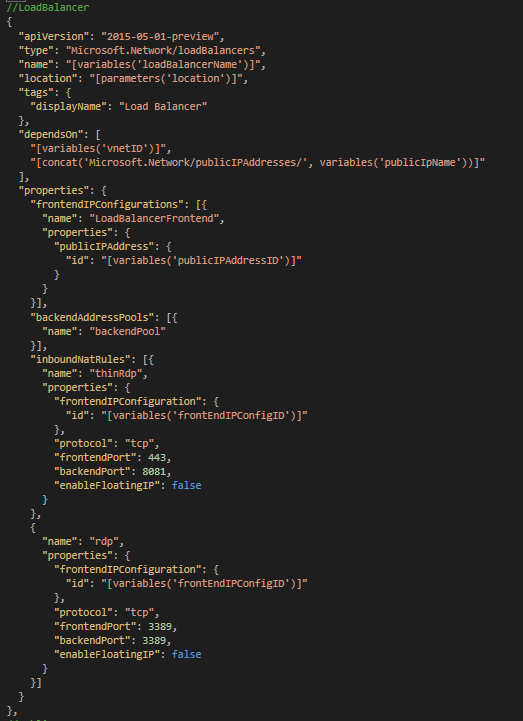 The URL to your storage account has to be specified in the extensionLocation parameter in ThinRdpVm.param.json as well as in SetupThinRdp.ps1! 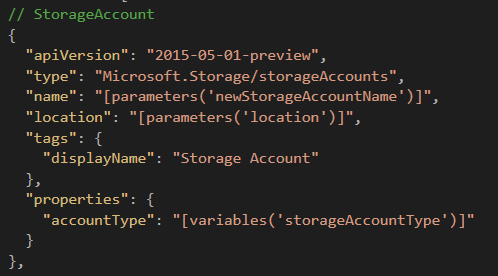 Also note that for this post, I was still using Azure PowerShell version 0.9.8. 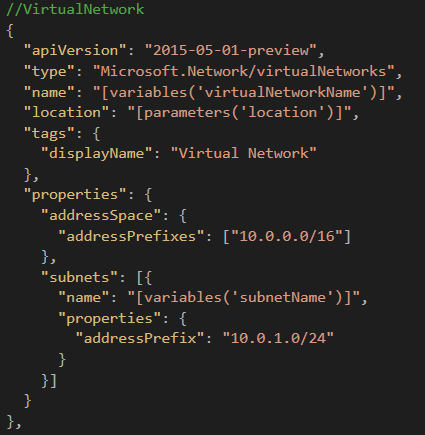 In the PowerShell 1.0 Preview Switch-AzureMode will be deprecated and the ARM cmdlets renamed, as described here. In the Config section you can change display settings, enable WebSocket compression, configure printer and audio access, etc. I recommend to switch on Smart Sizing in the Experience tab in the configuration, which will let you change the size of your browser with the RDP web session scaling along. 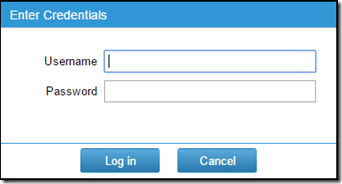 Connecting to the VM with the ‘Remote desktop’ option selected will present another logon dialog, in which you need to enter the admin credentials specified in the ARM template (adminUsername and adminPassword). 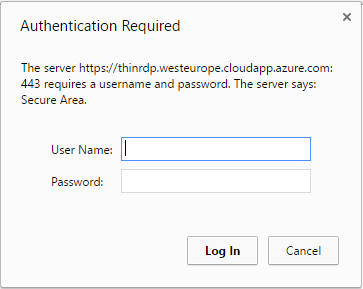 If you can’t access your Azure VMs via regular RDP due to blocked ports in the network or you don’t want to install additional clients, ThinRDP is a powerful option to access your virtual Windows machines via the browser. 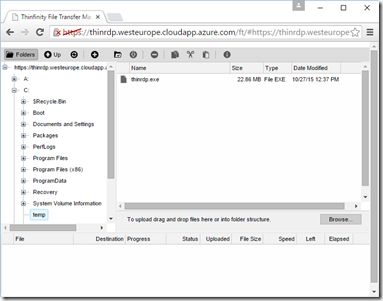 The ARM template and deployment model described in this post let you set up ThinRDP with minimal effort. 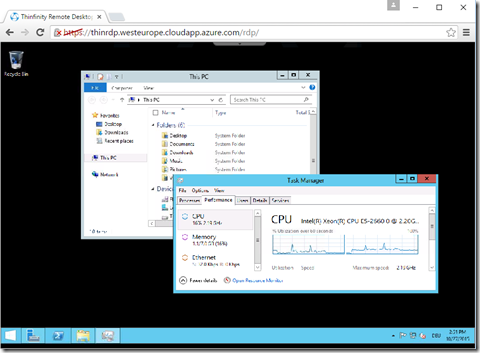 You might also want to use this approach to set up a dedicated jumpbox per virtual network from where to hop on to other machines (Windows or Linux) in Azure that do not have ThinRDP installed, avoiding common firewall blocking issues. 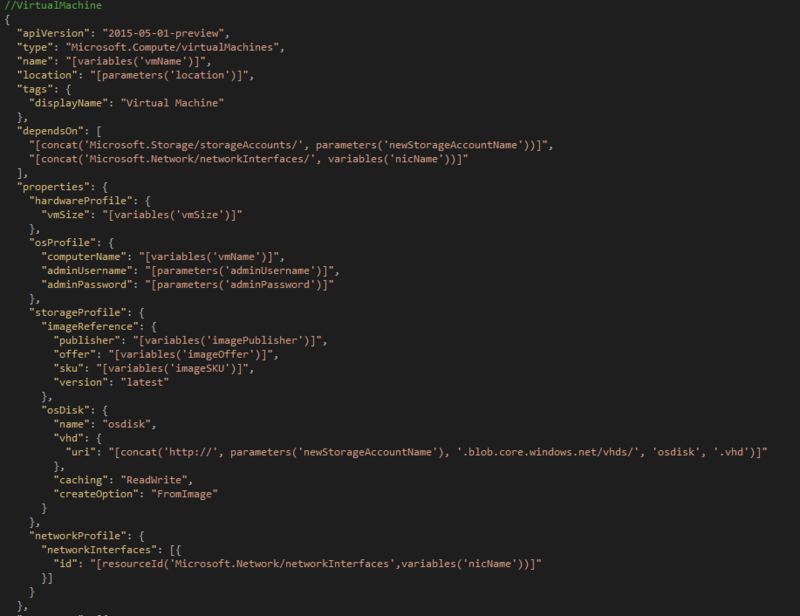 This entry was posted in ARM, Automation, Microsoft Azure, PowerShell and tagged ARM, Automation, Azure, IaaS, Microsoft Azure, PowerShell. 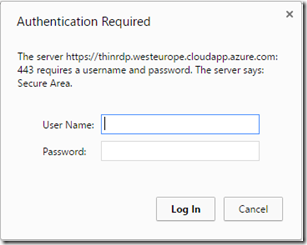 great article and I have just set this up on a test Azure VM but every time I sign out the application stops working – did you come over this issue? Thanks for the feedback, Keith. 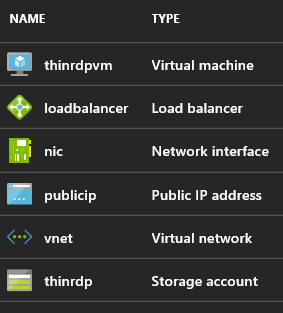 What application are you running in the VM? does this still work? 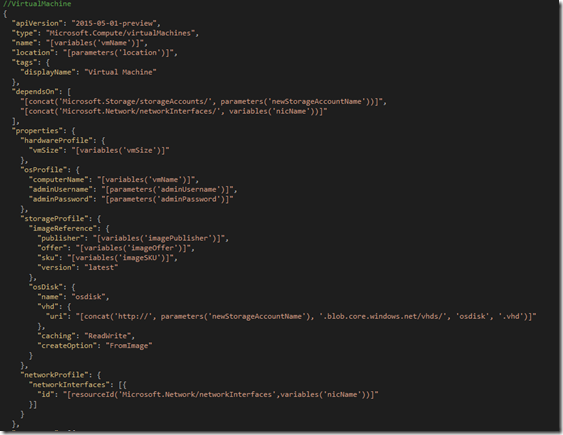 I just tried it using the deploy to azure button, but it doesn’t do anything…. Yes, still works for me. 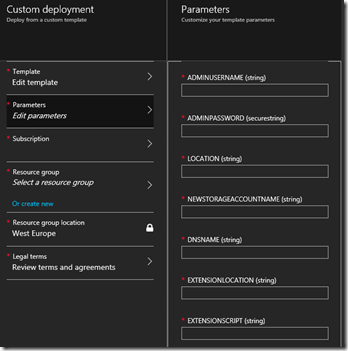 Are you getting authenticated into the Azure Portal? 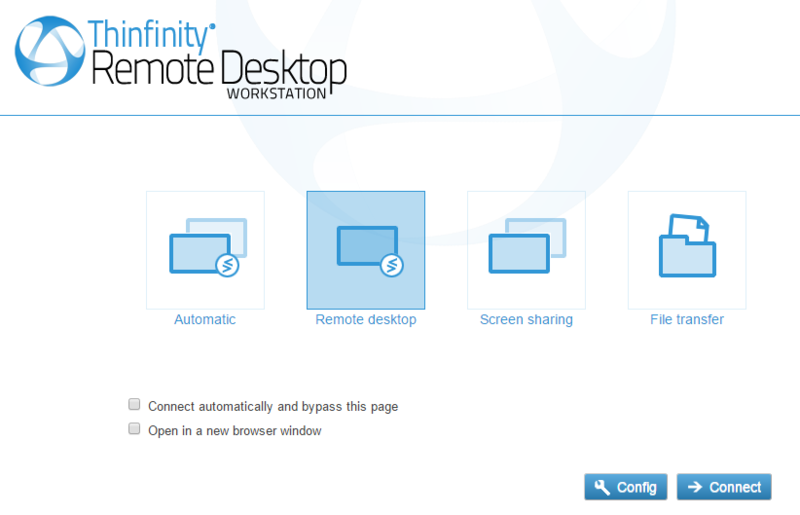 I already have a VM setup and would like to install Thinfinity. Are there instructions on how to do that? i.e I don’t want to create a new VM with ARM template as I already have a VM created with public ip.